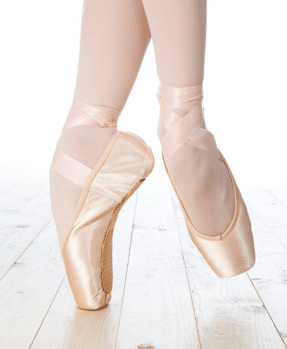 Have you always dreamed of dancing on your toes? Then this class is ideal for you. Everyone starting from 13-40 years is welcome in this class. No experience is necessary. We do advice to follow the Ballet Workout Beginners classes to learn the basics and correct body posture while taking the pointes classes. Choosing, sewing and adjusting the point shoes to your foot is an art. That’s why we will choose the pointshoes together and also sew them together. The teacher will help you out with everything from the beginning. Never buy point shoes by yourself in a shop if you don’t have experience in ballet. Advice first with your teacher about the brand, shape and hardess of your shoes. You should feel comfortable, be able to move and see you body. For the first trial class it is good enough to wear yoga pants or leggings and a top. On your feet you need pointshoes. For further classes a ballet leotard and ballet shoes are available at the spot for an affordable price. Make sure to bring a bottle of water to drink during the class.